BIO HENNA is 100% natural herbal hair coloring and treatment giving you red color and for dark hair giving mahogany color. BIO HENNA does not contain any chemical ingredients. It is composed exclusively with plants well known in India for their coloring and hair care properties. Due to natural ingredients it does not have any harmful effect on hair but what is more BIO HENNA makes them shiny, well nourished and stronger. This box is for medium-lendht and short hair. This box contains disposable gloves and cap. 1. Mix the powder with warm water (ca. 50C) in glass or ceramic bowl to get thick paste. 2. Wash hair with shampoo (Orientana best) and dry with a towel. 3. Put on the gloves and protect your clothes. 6. Wash accurately with warm water only. For 48h do not use shampoo, conditioners and styling products. BIO HENNA need to days to give you the wanderful final effect. Disclaimer! If you hair is very light blonde, chemically bleached or if it is totally grey please test on band of hair for the first use. Bio Henna doe not contain any chemical colors, pigments, preservatives, fragrances and aromas. Lawsonia colloquially called henna grows in India. Powdered leaves of lawsonia have been used for production of dye since the ancient Egypt. The coloring features come from lawsone - the component that appears naturally as hennotannic acid. Lawsone penetrates hair and tides with hair keratine. It makes areola that not only colors the hair but protects it. 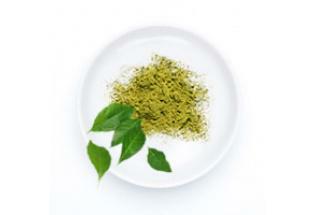 When mixing lawsonia with other plants we obtain outstanding colors to naturally dye hair. The youngest leaves we use the better dye. Additionally henna provides micro elements crucial for hair grow such as copper, zinc and iron. it has antibacterial and antifungal features.